Many synths have some great FX built right into them. Serum stands alone in a class of its own on when it comes to effects available directly within the synth. Serum has 10 FX modules that’ll powerfully maximize the potential of your sound design when creating new sounds. Serum also has a brand new function that allows you to save effects chains and load them into different presets. Not only does this save a LOT of time, it gives you an opportunity to experiment, and saving and loading new FX chains in Serum is RIDICULOUSLY easy. The best part about using FX with Serum: you can assign modulation sources to ANY of the parameters in any of the FX modules you have selected, and when you load up a new FX chains, the modulation carries over. In this tutorial, Darkside Funk Sound Designer, Dan Dusko, shares how he uses Serum’s effect chains to take his sound to the next level, and how to save effect chains for future sound design experimentations. Let’s take a look! Do you want to learn how to unleash Serum’s power features? So much potential lurks under the hood of this incredible synth. 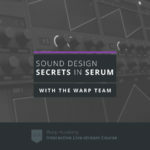 Our pro sound designers at Warp Academy have been working round the clock to bring you a brand new course: Sound Design Secrets in Serum. If you want to learn how to make wavetables like a BOSS, shape sounds to perfection using advanced filters, learn “must have” tips on how to make Serum highly playable, & get the sounds you want FASTER, then sign up NOW! It’s FREE!